Well, I've been super busy with photo sessions, deployment session with OpLove, my normal photojournalist job and on top of that, my husband has been working nights so Mom-duty is in full force. So, I missed the sunset today. BUT I promised you guys that I would have today's challenge for today. So.... I had to think fast. I had a few extra minutes to myself after the kid went down for the night. I made myself a little something-something. I call it, My Malibu Sunset. 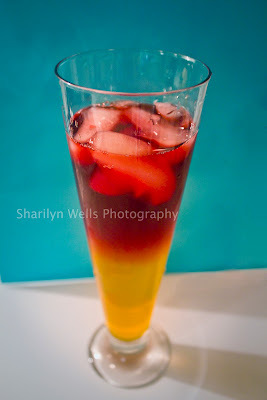 Mango vodka, Malibu rum, and cranberry juice .... num num num. All I need is a little umbrella, the beach, and my sunglasses and I'm set!